...Presidential Electronic Trendsetters in footsteps of Lincoln. "President Johnson believed in using the telephone, and his staff saw to it that he was never more than two minutes from one no matter where he was." 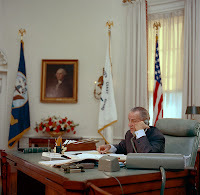 LBJ on phone in Oval Office. thick cable connecting the console. President Lyndon Baines Johnson (LBJ) was an early adopter of complex telecommunications to stay in constant communication wherever he went. Through this method he was able to keep tabs on a volatile social political environment he wanted to control. 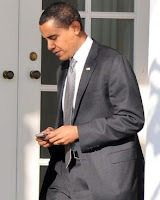 He advanced the use of telecommunications in the Office of the President and the White House, paving the way for a 21st century President Obama to use a Blackberry device. When he was elected Vice President in 1960 LBJ's "telephone mania" was kicked into high gear and he required even more telephone equipment at the LBJ Ranch . The ranch was served by the Independent Telco Southwestern States Telephone and the high level communication needs in ranch country required a complex arrangement between them and the nearby local Bell System company, Southwestern Bell in Austin. The assassination of President Kennedy meant an immediate increased demand for instant communications at the ranch by the "always on" new President. On Privateline.com in Telephones at the LBJ Ranch the story of how sudden communications needs were met at the LBJ Ranch, during that national emergency, is recounted from the out of print Good Connections: A Century of Service by the Men and Women of Southwestern Bell by David Park Jr. It is a study in how the regulated wireline telecommunications infrastructure stepped up to meet the needs of a President demanding instant communications in a manner that gives every indication he would make use of wireless devices and the internet today. Also in that section is Don Kimberlin's brush with LBJ's telephone mania and experience with POTUS setup for President Richard M. Nixon. President Johnson pushed the envelop of available telecommunications for instant messaging through electronic communications in the 1960s and that included personal involvement in the conducting of a war. A century earlier, President Abraham Lincoln pressed boundaries of available electronic technology by extensive use of the telegraph for instant messaging. President Abraham Lincoln is a hero of President Barack Obama and Mr. Lincoln's T-Mails: How Abraham Lincoln Used the Telegraph to Win the Civil War by Tom Wheeler (2006) is a friendly read on how President Lincoln combined his skill as a writer with use of the telegraph for effective immediate electronic communication to win the Civil War. Tom Wheeler plays a role and is influential in President Obama's telecommunications policy. It is helpful in understanding how electronic communications that advance in one President's administration permanently changes social communication in the Office of the President . "Oh Doctor please, some more of these, outside the door..."